For my card, I went with a new set of dies I'd just received. When these were first released, I was a bit put-off by the price, but the more I saw them being used, the less the price seemed to bother me! Then of course, they went out of stock for ages, so I only got my hands on them recently. I didn't have a yellow cardstock that I really liked, so I created my own by using some Lemon Zing ink and white card. Once that was done, I die-cut flowers and foliage and arranged them into a corner "bouquet". I stamped the sentiment in black ink and then adhered down the flowers. To finish the card, I used some white Nuvo Crystal Drops to make some enamel dots and also a white gel pen to add dots to the centers of the blue die-cuts. Thanks for visiting. 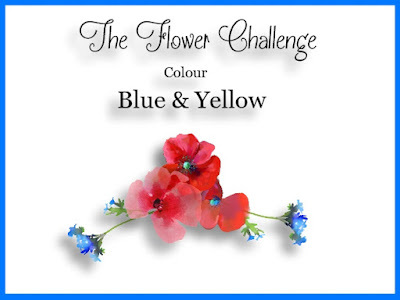 Head on over and check out what the rest of the design team have come up with and don't forget the challenge stays open until 25 January, so you've plenty of time to play along! Love these pretty stitched flowers! Hello Karren: This stitched flowers look like they are cut out of felt, love the detail of the Nuvo Drops, they add even more beautiful dimension to this design. Brilliant card, love these stitched flowers all bunched up and the colour combo is perfect. Love it and going to try it, I bought stitched flowers (not same brand) and hardly use I so struggle using them. Beautiful design. I felt the same way as you about this flower set and finally got it after it was back in stock. 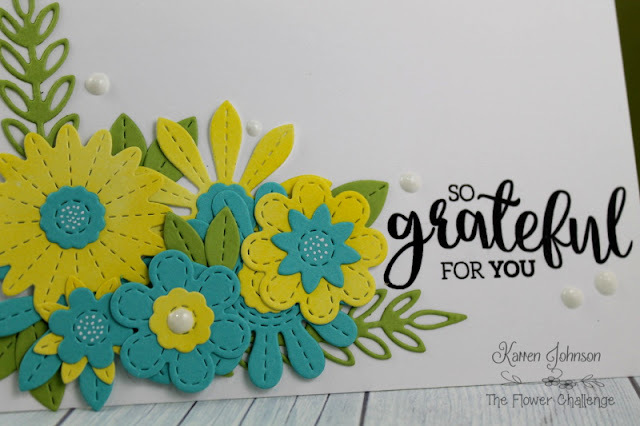 Love your pretty card and the pretty layered flower cluster. Such wonderful colors and gorgeous stitched flowers ! 2nd note to myself : buy a ticket to New Zealand and take floral card making lessons from Karren. How clever you are to create your own c/s...beautiful shade of yellow, too! I really love how you clustered the flowers and how you added Nuvo drops to your design! Another gorgeous card, Karren!! !